Do you have a crazy worm bin? fame. On this page we want to show that you don't have to purchase an expensive worm bin to recycle your kitchen- and garden waste. There are a lot of homemade wormeries around that are helping to recycle huge amounts of food waste in backyards, garages and cellars. We are looking for those crazy worm bins that you have designed and build yourselves. Do you have a container you decided to convert into a worm farm? Worms are not fussy! If you make sure their basic requirements are met they will live, breed and multiply just about anywhere. Like in the picture below! 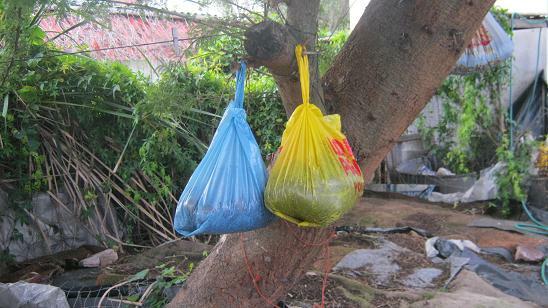 They even live in ordinary plastic bags hanging on a tree!! The bags are a compost worm experiment we started a while ago! We added safe worm bedding, different kinds of food and some compost worms to 3 worm bins. Actually more accurately we should call them worm bags! A few holes in the bottom of the bags to ensure proper drainage, and some air holes at the top for enough air circulation and ready where our Budget worm farms! They have been hanging in the tree since the 15th of May 2012. I am checking out all three bags regularly and the worms are fine and seem to be enjoying themselves. They have survived several cold weather fronts with loads of rain and are safe from moles which are amongst their worst enemies. In addition the worms have a shady place in case the sun decides to burn down on us one of these days! I will continue the experiment and will tell you more about the worms well being and the speed of the recycling in the near future. certainly amongst the more unusual and cheapest worm farms and living prove that worms can grow on trees :-) !! Where do yours grow? If you have an unusual worm bin or want to ask or share something around the subject of worm farming please share it with us on the form below! Return from "My Crazy worm bin" to the "Home Page"
Find out more about "Worm food"
Do you have a special worm bin? Do you have a worm bin that stands out from the crowd? Is your worm bin bigger, cheaper, funnier or more original than those of your neighbors and friends? Please share it with us! Send us a picture and share a bit about the story behind your worm bin! Do you have some pictures or graphics of yourself and your worm bin? Important Note: The maximum image size accepted is 800x600. Please only upload (jpg or gif) files with a maximum size of 100kb per image. Please resize any photo larger than 800x600 pixels using your graphics software or a Web-based resizer, such as Picnik. I recently converted an old bathtub into a real big worm farm It works very well! and I can tap of worm leachate at the bottom as well!